A group of prominent Canadian women have launched a campaign to make the English-language lyrics to Canada's national anthem more gender-neutral. 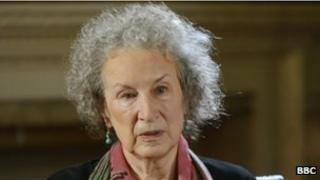 The group, which includes author Margaret Atwood and former Prime Minister Kim Campbell, objects to the line "in all thy sons command". The women say a revision to O Canada's lyrics would "encapsulate the equality of all Canadians". In 2010, the government rejected a previous effort to change the words. The campaign, also backed by Senator Nancy Ruth and former Senator Vivienne Poy, calls on Canadians to encourage Prime Minister Stephen Harper's government to alter the official English lyrics to O Canada. They would change the line to "in all of us command". The song was first performed in 1880, with several different versions of the lyrics emerging in the coming years, according to Canadian Heritage. The song took its current form in 1927, and was declared the nation's official national anthem in 1980. The women say the English version of the song at one point contained the line "thou dost in us command", with that line revised in 1913 to "in all thy sons command". The proposed new lyrics coincide with the 100th anniversary of the revision and "have the same meaning" as the earlier version, the group, Restore Our Anthem said. "Restoring the anthem to reflect its original version is the simplest way to encapsulate the equality of all Canadians," the group said on its website. Ms Atwood said the current official lyrics suggested "only male loyalty is being invoked". "Restoring these lyrics to gender-neutral is not only an easy fix to make our anthem inclusive for all Canadians, but it's also long overdue," she told CBC News. The Canadian government, led by the Conservative Party, dismissed a similar request to change the anthem to more gender-neutral language in 2010. "We offered to hear from Canadians on this issue and they have already spoken loud and clear. They overwhelmingly do not want to open the issue," Dimitri Soudas, a spokesman for Mr Harper, said at the time. The leader of the opposition New Democratic Party has also dismissed the new effort, saying the anthem is "wonderful" as is. "We seem to have agreed on the English and French versions as they are and I think that's probably a good thing," Tom Mulcair told CBC News.